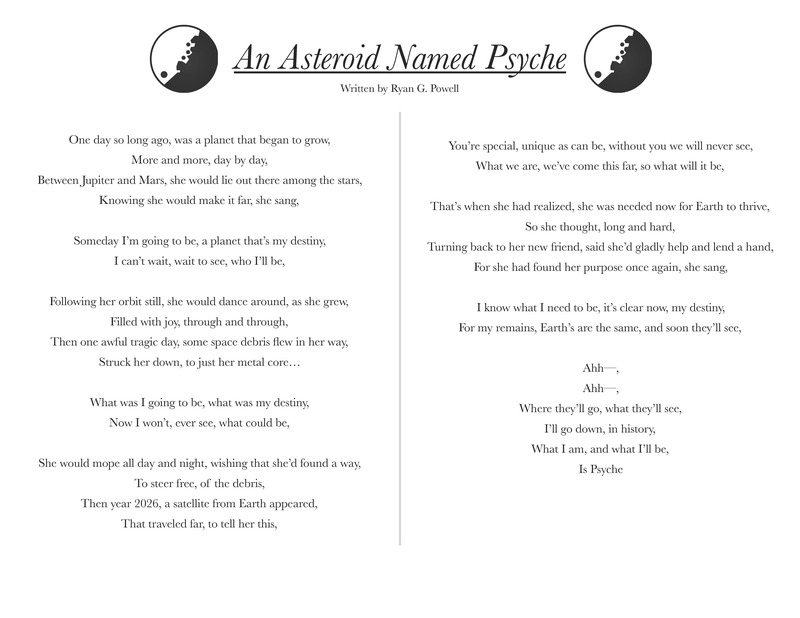 An Asteroid Named PsycheAn Asteroid Named Psyche is a children’s song that I wrote, which follows the asteroid’s story. I wanted the song to be both educational and exciting for kids, so I brought the Psyche asteroid to life and created a story that could have a nice little moral while staying on target scientifically. I wanted it to be about ‘purpose’ because I think that’s something that a lot of kids really struggle with – myself included! I aimed for the melody to be catchy, singable, and somewhat repetitive. The vocals and guitar were recorded by my friend Amelia Murray, a New York City based singer-songwriter, who did an amazing job of giving the tune a character. Along with the recording, I created a lead sheet and a lyric sheet, both of which will be shared with various schools for any choirs or classes that would be interested in learning the song and learning about the mission!